The seagulls look so nice and natural in your photos (as opposed to those hanging around on the scrounge at carparks). was standing on top of a car in a carpark. Nice Steve! Wonder what happens if they get too close to the waterfall! I don’t know, but I can tell you I didn’t see any gulls going down the falls. 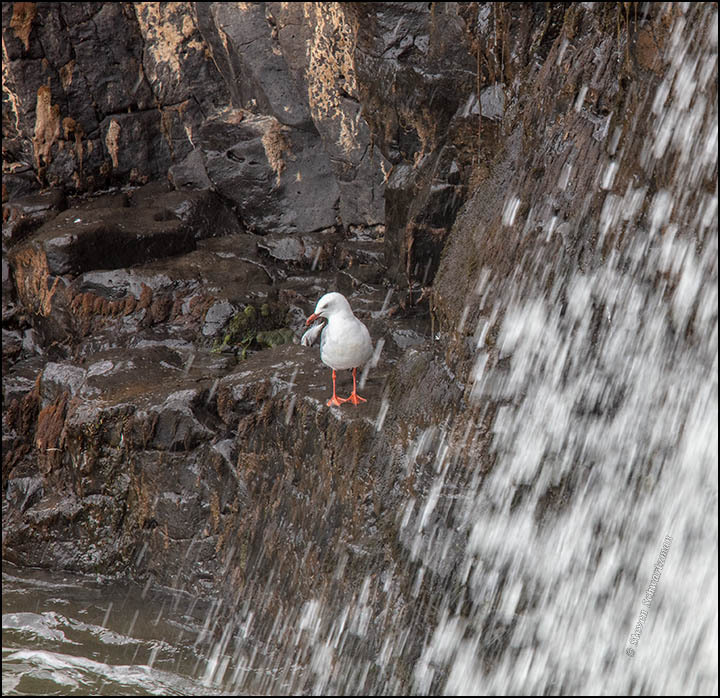 Beautiful falls and what a great photo of the gull! I managed to catch the gull in the last photo at just the right split-second. Most of the other gull pictures from that sequence were mediocre. Great composition on all of them! I love looking at them all. Three for three: now that’s a ratio I appreciate. 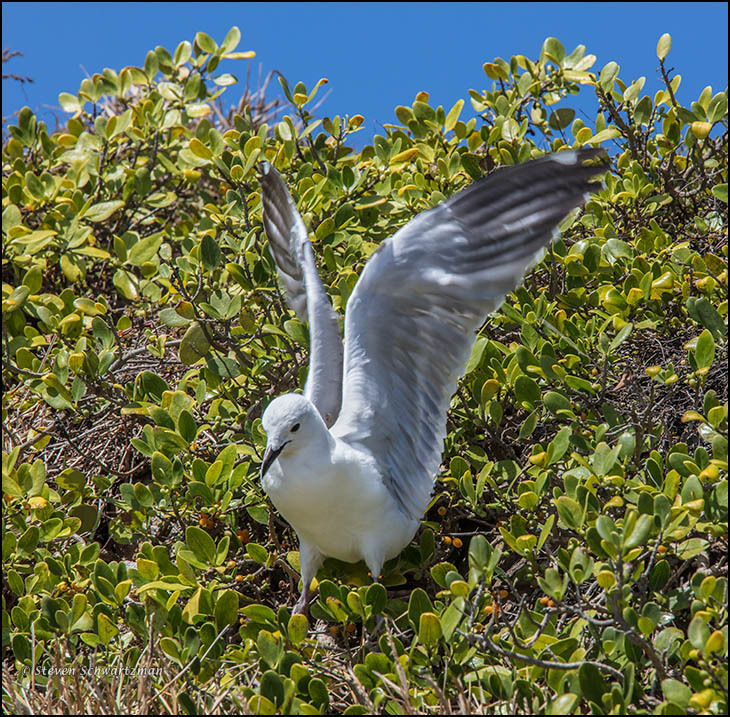 Not only are the settings of the second and third photos quite different, it appears that you found two species of gull. That’s a nice, additional bit of diversity. It’s interesting that the gull in the shrubbery was eating berries. I’ve been trying to recall if I’ve ever seen a gull plucking berries, and I can’t say that I have, although I did find a reference that listed our herring gulls as berry eaters. The second photo’s my favorite. I like the way the bird seems to be standing almost exactly at the intersection of rocks and water, and the way those pure white feathers are echoed in the white water. Since the second picture is your favorite of the three (white flowers spreading to white birds? 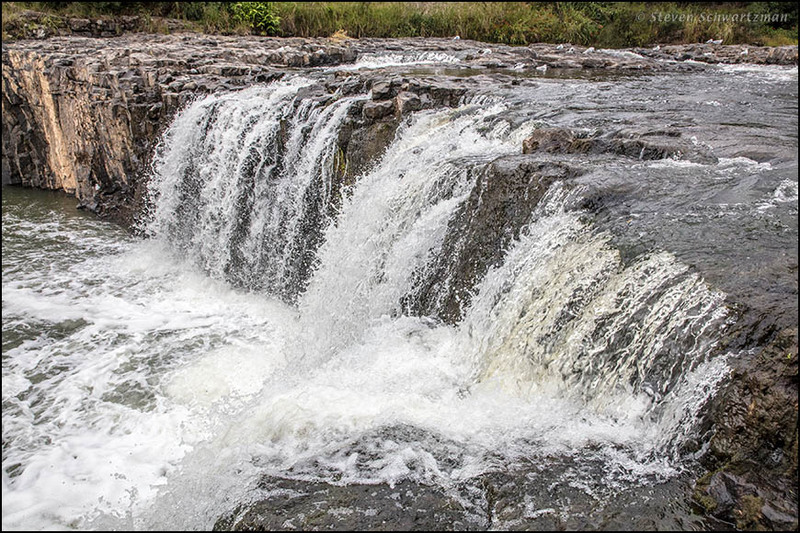 ), I’ll add that I cropped off a lot of falling water at the right. Even at my maximum 280mm, I couldn’t zoom in as close as I wanted. The third picture remedied that. Nice work and I also like the second most with the falling water and the sidelong glance. And, as well, kudos for “gull” and not “seagull”. Interesting that you and Linda both favor the middle picture. What appeals to me about it is the whiteness of the bird against the darkness of the rocks. Through this blog and others I became aware that birders have a thing for gull and against seagull. The latter is what I grew up saying, and I get the impression it’s still what most people say. It certainly would work in New Zealand, where no place in the country is even one hundred miles from the ocean. I sometimes still have trouble believing I’ve been to New Zealand twice in the last four years. Hey, New Zealand is not in Texas! . . . or Oklahoma! Oh . . . of course. I can’t believe how quickly the time has passed. Have you ever been to the Puheke Reserve on the Karikari Peninsula? Well, you have the coast at hand where you are. As visitors for just four weeks, we crammed in as many places as we could.